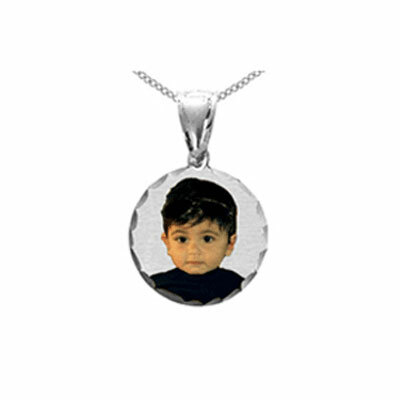 Apples of Gold's Round Photo Pendant made of stunning white gold features a beautiful pendant and color photo customized just for you. The white gold pendant features an intricate design that accentuates the photo and catches the gleam of the light. The pendant is 5/8inch and is the perfect size for a pendant perfect for every day wear and use. Say "I love you" to that special someone and let everyone know who the important people in your life are! Get the beauty and shine of silver with the value and the stunning design of white gold that is available in either 14k or 18. See for yourself why the white gold Picture Jewelry Necklace is a must have for any fan of fine jewelry. We guarantee our Round White Gold Color Picture Jewelry Necklace to be high quality, authentic jewelry, as described above.